The Complete Merc Armour Package will go a long way to making you look like a warrior fit for battle. 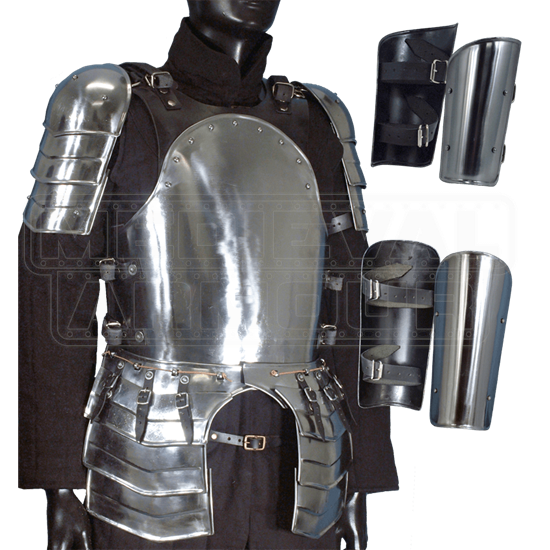 This armour is definitely an effective set for a warrior, one that will keep you safe and secure on the field of battle. Well suited for the traditional mercenary, this armour is simple, straight-forward, and effective in it's purpose. 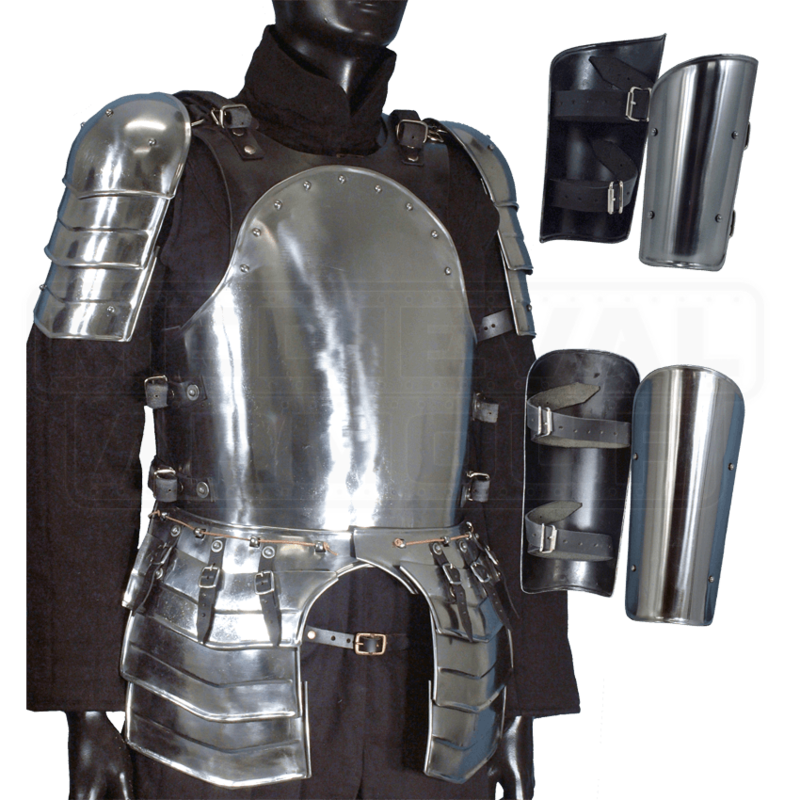 This armour package includes the Merc Steel Cuirass, the Merc Steel Tassets, the Merc Steel Pauldrons, the Ready For Battle Steel Arm Bracers, and the Ready For Battle Steel Greaves. The combination of leather and steel on the breastplate keeps a warrior agile and light, while the other pieces of steel armour protect vital areas. Of course, this armour will also make you look great, as nothing is more impressive than a warrior in gleaming steel armour. The metal parts of the armour are crafted from 18 gauge mild steel, while the leather pieces are made from 7/8 ounce leather. Most of the armour is worn using leather straps and buckles, although the tassets are designed to be tied into the steel pegs along the fauld of the breastplate. This Complete Merc Armour Package is as effective as it is impressive, and it is a great suit of armour to wear, whether you are just waltzing about at a renaissance fair or heading onto the field of battle for a theater production, a LARP encounter, or even an SCA reenactment (check with your local chapter to get approval first). Available with black or brown leather. These are the measurements of the armour only, and do not include the measurements of the straps and buckles. This will show you how much of your form the chosen piece of armour will cover. Please keep in mind that if you are planning on wearing a gambeson, heavily padded shirt, or anything with any possible added bulk under your armour, you should take your measurements while wearing the garments and order with that number in mind for your armour.